Integrated Sensing Systems (ISS) offers analytical and laboratory sampling instruments for measuring BRIX, °Plato, concentration, specific gravity, viscosity, and density. These instruments are designed to deliver fast response times and uncompromising accuracy for sampling processes. The principal of operation is based on the Coriolis effect. The resonating sensing tube takes advantage of MEMS technology. These devices have MEMS inside. The result is a very accurate density measurement for performance in a compact package. 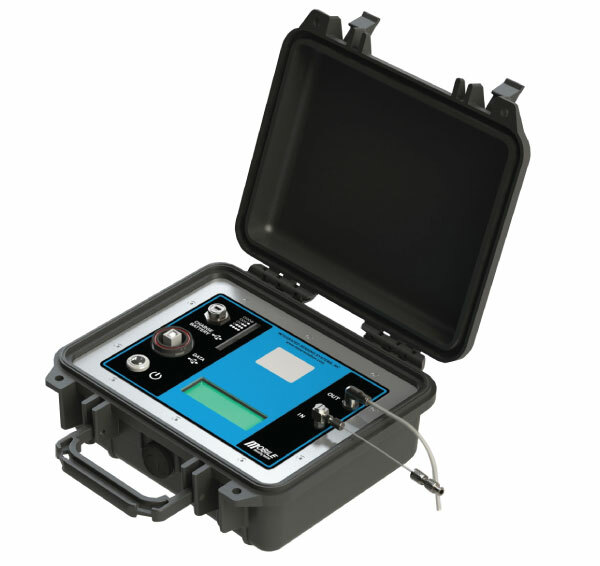 The ISS Mobile Density Meter or MDM150 is a rugged, accurate, low cost instrument for measuring liquid density and viscosity in portable applications. Think of it as a mobile laboratory density meter. The MDM150 uses the ISS patented density sensing technology along with low power electronics and powerful software to create a very useful liquid density meter. All of this is packaged in a small, sealed plastic case for use in almost any environment. The user interface for the MDM150 can be any desktop, laptop or tablet computer running Windows software and the Fluidic Communication Software. The user can configure, display and record results. The computer also powers the MDM150 through the USB port. MDM150 measures liquid density to a resolution of 0.0001 gram/cc and an accuracy of 0.0005 gram/cc. Optional dynamic and kinematic viscosity can be measured from 0-50 cP (0-50cSt) Liquid temperature is measured with a range from 5° to 60° C with an accuracy of 0.3° C.
Density and temperature can be used in the device to calculate concentrations such as % ethanol in water, % glycol in water and sugar in water (BRIX). The MDM150 also easily fits into a laboratory environment and is an economical alternative to dedicated laboratory density meter. If you are interested in pricing, please contact orders@mems-iss.com with the product and quantity, and someone will respond to your inquiry promptly.